The DC Commission on the Arts and Humanities invites you to submit nominations for the 24th Annual Mayor's Arts Award, the most prestigious honors conferred by the city on individual artists, organizations, and patrons of the arts, which will be held on Friday, March 27, 2009 at the Kennedy Center, presented by Mayor Adrian M. Fenty. For a complete entry form, please download the 2008 Guidelines/Application available online. You may also contact (202) 724-5613. UNLIMITED EDITION is a juried show about the relationship of the art world to reproduction and marketing. We're looking for artists who produce lots of unnumbered multiples of an image or an object…or who incorporate mass-produced products into their work…or who simply explore the commodification and mass-reproduction of art through various means. JURORS: Kriston Capps, Martin Irvine, Welmoed Laanstra. Full prospectus and application here. Paul Wolf, Twist, lemon poured glass, 30"x5"x6"
jodi, Symphony, mixed media on panel, 47"x80"
The paintings and sculpture in this show were born of the sophistication, simplicity and elegance of two artists whose work needs no message. For jodi and for Paul Martin Wolff, who came to art later in life, form and texture reign. And, in this exhibition, the ying and yang of their work is harmonious: black and white, smooth and textured, opaque and luminous. For jodi, creating textured surfaces with environmentally safe materials is a noble pursuit and for Wolff, it’s all about delving into the medium he uses. When not making art, Wolff enjoys the challenges of life as a successful attorney, and jodi gives seminars to artists across the country. Both have exhibited their work at Zenith Gallery for years, and their pieces are in private and corporate collections across the US. The Center for Fine Art Photography, Ft. Collins, CO announces that Charleston, WV photographer, Bruce K. Haley, Jr. has been selected to participate in its international juried exhibition Art in Nature. Bruce’s image Reaching Out #2 was one of 50 images selected by renowned nature photographer, George Lepp. Five-hundred photographers, worldwide, submitted a total of 1,931 images for the exhibition. Art in Nature will run from December 5, 2008 to January 3, 2009 at The Center for Fine Art Photography, 400 North College Avenue, Ft. Collins, CO. 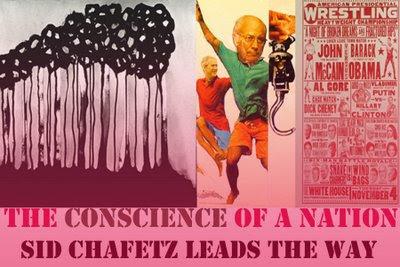 In addition, the exhibition can be seen online at http://www.c4fap.org beginning on December 5, 2008. For more details, contact Azarie Furlong, Exhibitions Manager, at the Center for Fine Art Photography, (970) 224-1010. Mr. Haley’s fine art photography, including Reaching Out #2, can be seen at www.BKHaleyPhotography.com. Mr. Haley can be contacted at (304) 346-9360. Take a look at Arlington,Virginia's urban art book that features over 50 planes, whimsically decorated by amateur and professional artists alike. Crystal Flight, a Celebration of Air and Art pays tribute to Arlington's longstanding connection to air and space travel through this community project. 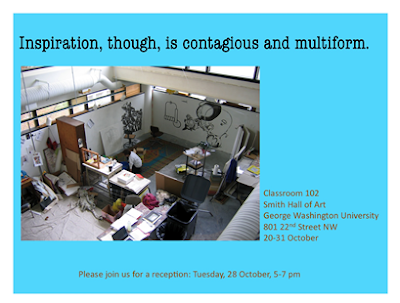 Inspiration, though, is contagious and multiform. Eugene Leake, a Maryland landscape artist and visionary leader in arts higher education. He was ispired by the landscape painting of French Barbizon master, Jean-François Millet and George Inness landscape paintings. Leake's expressive compositions reflected his awareness of the variety and fleeting aspects of nature. Civilian Art Projects presents two contemporary photography exhibitions: DARFUR/DARFUR, a traveling exhibit of images by world-renowned photojournalists on the crisis and culture in Darfur, Sudan, curated by Leslie Thomas; and, Pastime, an exhibition of emerging photographers with distinct points-of-view. Photographers in DARFUR/DARFUR include Lynsey Addario, Mark Brecke, Helene Caux, Ron Haviv (VII), James Nachtwey (VII), Paolo Pellegrin (MAGNUM), Ryan Spencer Reed, Michal Safdie and Brian Steidle. 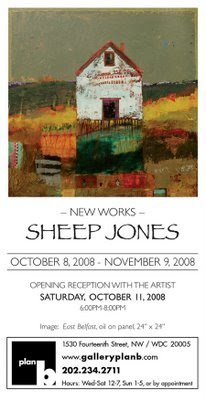 Each year, the Zenith Gallery brings together artists with tasty subject matter, celebrated local restaurants and chefs, and happy guests for a party to launch a new food-art-themed 2009 calendar. 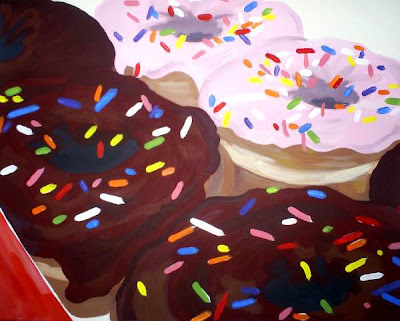 This year's Zenith Community Arts Foundation (ZCAF) continues to support the Capital Area Food Bank with “Food Glorious Food IV: Changing Courses,” an annual benefit at Zenith Gallery in Penn Quarter. by Emily Lyons, Washington Spaces. The art and recipe filled 2009 Food Glorious Food Calendar is available for $15 with all proceeds going to the food bank. Margery Goldberg, of the Zenith Community Arts Foundation (ZCAF), and Lynn Brantley, of the Capital Area Food Bank (CAFB), will be featured with Andrea Roane and Mike Walters (Board member of Capital Area Food Bank). They will be talking about the 2009 Food Glorious Food Calendar and showing some of the original art. See DC Creates Public Art Weblog with pictures of yesterday's dedication ceremony at Lamond Recreation Center. Mural created by Washington, DC Muralist G. Byron Peck of City Arts. Art Whino presents JIMBOT: Machine, Man, Monster. The exhibition will feature the illustrative and playful works of JIMBOT, Milwaukee based painter and freelance illustrator. Preview event and opening reception! A sampling of Jimbot’s exhibition will be on exhibit as well as select pieces from the Art Whino’s extensive artist collaboration. As a part of Americans for the Arts Creative Conversations initiative, Art Whino will be hosting a panel discussion on the validity of current art trends within the larger realm of fine art. Panelists will debate whether or not Lowbrow and Pop Surrealist art carry the same amount of cultural significance and demand the same respect as more traditional forms of contemporary art. Music by DJ Adrian Loving and Tom P live on the congas. 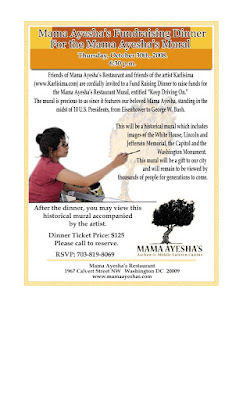 Come out for a delicious dinner served Family Style to support the community and to raise funds for the historical mural by Karlisima at Mama Ayesha's Restaurant. After dinner, join the artist to view the mural. Washington Project for the Arts presents it's second member workshop in the 'No Artist Left Behind (NALB)' series. Just in time for Halloween, and the upcoming presidential election, a couple of financial experts will be giving advice on how to navigate these spooky economic times. Refreshments will be served. Space is limited and you must sign up for the workshop (current WPA members only). Brought to you by WPA and the NALB program. What's NALB? To refresh your memory click here. The University of Alabama in Tuscaloosa has announced that Paul R. Jones has donated his collection of American art to the university. The collection includes one of the largest and most comprehensive collections of twentieth century African-American art in the world. Valued at $4.8 million, the 1,700-piece collection encompasses art in a variety of media and from more than six hundred artists, including Romare Bearden, Prentice Herman (P.H.) Polk, Elizabeth Catlett, Jacob Lawrence, Carrie Mae Weems, Sam Gilliam, and Benny Andrews. “$4.8 Million Paul R. Jones Art Collection Donated to UA.” University of Alabama Press Release 10/14/08. This marks Tony Savoie’s first show in Washington, D.C., New Works is a combination of two separate series—the Command Series and Icons Incorporated. Savoie’s process is intricate in its execution, laying reverse painted pieces of clear acrylic onto backgrounds composed of found photographs and artifacts. He uses a wide range of medias, from spray paints to pencils, photographs, stencils and oils to create his multi-dimensional statement. Come early for the 8 PM showing of 7 x 1 Samurai, a one-man retelling of Kurosawa's 7 Samurai, named Best Solo Performance for the 2008 Washington Fringe Festival and hailed by the City Paper as "serious, sidesplitting, mesmerizing stuff." Space in the theater is limited so call the Warehouse at 202 783-3933 to reserve a seat. Can't make the show? Join us afterwards to groove to the scorching rhythms and soulful melodies of OmegaBand, kicking off at 9PM. The Phillips Collection Center for the Study of Modern Art's 2008-2009 Conversations with Artists lecture series focuses on "Engaging Spaces," featuring artists who transform spaces through a variety of media. As part of his artistic process, artist and provocateur Vito Acconci uses architecture, performance, installation, and film to encourage viewers' participation in his work. The Acconci Studio specializes in architecture and landscape design that integrates public and private spaces, such as Mur Island, Austria, 2003 and Open-bookstore, Armory Show, New York, 2007. Dedication for the new mosaic mural at Lamond Recreation Center. The Lamond Recreation Center is the first LEED® Silver Certified building in the District and features a host of after school programs and activities for students from surrounding schools. In partnership with the DC Department of Parks and Recreation (DPR), the DC Commission on the Arts and Humanities (DCCAH) announces the installation of a mosaic mural by DC public artist G. Byron Peck, City Arts, LLC. Located at the intersection of Kansas Avenue and Tuckerman Street, NE, Washington, DC, Lamond is designed to revitalize and enhance the mind, body and spirit of the users and the surrounding urban community. It is also designed to provide the neighborhood with an environmentally efficient recreation facility, the first LEED Silver Certified facility built by DPR. Utilizing sustainable and recycled materials, the 12 by 16 foot mosaic mural enhances the facility’s unique characteristics and highlight activities within the community. It contains references to native plant life, sports and multigenerational relationships that are reflected within the community. G. Byron Peck, City Arts LLC, has created more than 20 high-profile public murals, mosaics, and other artworks, mostly located in Washington, DC. In April, Peck received First Prize for Creative Use of Mosaic in Commercial Project at the International Spectrum Awards in Miami. The project, funded by the DCCAH, involved four 300-foot long mosaic sections spanning the walls of the 12th Street Tunnel where it joins Maine Avenue, SW, also known as the Southwest Gateway. The Lamond Recreation Center mosaic mural is made possible through the generous funding from the Department of Parks and Recreation and commissioned by the DC Commission on the Arts and Humanities. The Pennsylvania Academy of the Fine Arts (PAFA) is the only East Coast venue for the most comprehensive survey of Peter Saul's work ever to appear in the United States. Peter Saul: A Retrospective will be on view in the PAFA’s Samuel M. V. Hamilton Building, Fisher Brooks Gallery. Peter Saul has challenged viewers and the art world with his hilarious yet transgressive figure paintings. Unafraid to tackle difficult political subjects or examine both the individual or national psyche, Saul is one of the most influential and divisive artists of his generation. Organized by the Orange County Museum of Art and curated at PAFA by Curator of Modern Art Robert Cozzolino, Peter Saul: A Retrospective is the first major American survey of Saul’s work, featuring 50 paintings and drawings from 1958 to the present, including large-scale “historical epics,” satires of art history, and several of Saul’s most recent paintings addressing World War II and the war in Iraq. The PAFA presentation will include material not shown at other venues, borrowed directly from the artist, including several working sketches and Clemunteena Gweenburg (1971) from his scathing series of Art World Portraits. Saul will also debut a painting, currently in progress, inspired by Thomas Eakins’s Portrait of Dr. Gross (The Gross Clinic) this Fall. Three important and beautiful series of black-and-white landscape photographs are showcased in Oceans, Rivers, and Skies: Ansel Adams, Robert Adams, and Alfred Stieglitz. This focus exhibition features 21 works in chronological order: ten by Alfred Stieglitz (1864–1946), five by Ansel Adams (1902–1984), and six by Robert Adams (b. 1937). The three series have never before been exhibited together, and Stieglitz's Music: A Sequence of Ten Cloud Photographs was last seen in its entirety in 1923. The people who are running the 26-mile race a week from Sunday are probably now hitting the most intense days of their preparations. Those not taking part will be able to watch these dedicated runners as they cross various points along the course; this year, the finish line festival will be held on Wilson Boulevard in Rosslyn, where you'll find a beer garden, food tastings, vendors and performers. If you don't feel like hanging out there, Crystal City's Crystal Run festivities are just down the road, with music act the BoDeans, samples from local restaurants (with tastes priced at $1), a kid zone and the chance to cheer on runners as they pass through (it's at Miles 21 and 22 of the race). The festivities are free. Oct. 26 beginning at 9 a.m. The BoDeans perform at 3 p.m. in Crystal City, Crystal Drive and 23rd Street. In Rosslyn, Wilson Boulevard at Lynn Street. Ten original, artistic mile markers for the upcoming Marine Corps Marathon were unveiled during a press conference in Crystal City, Virginia on October 10. The mile markers, which include mile 1 and mile 26, represent each of the ten miles of the annual MCM that are run in Arlington County, Virginia. Designed by local artist Kevin Irvin, the colorful nine-foot tall, graffiti-style mile markers will displayed on the MCM course on Sunday, October 26. The mile markers are part of larger partnership between the Marine Corps Marathon and Arlington County. On race day, spectators and runners will be able to enjoy exciting activities in the Arlington neighborhoods of Crystal City and Rosslyn. Crystal City hosts Crystal Run, a family-friendly fall festival from 9:00 a.m. until 3:00 p.m., which lines 23rd Street and includes live bands, food tastings, activities for kids of all ages and a spectacular spot for spectators to view runners at miles 22 and 23 of the MCM course. After crossing the finish line, runners will proceed to the Finish Festival, held on Wilson Boulevard and Lynn Street in Rosslyn, to retrieve their commemorative finisher coins, provided by USAA, as well as to enjoy live music, food, giveaways and more! Later, Crystal City hosts the Post Race Celebration and Concert, featuring the BoDeans at 3:00 p.m.
For more details as well as transportation information, visit For details and a map of the course, visit http://www.marinemarathon.com and click on weekend events. This series is an in-depth study of human intimacy and the beauty of surrendering and committing one's life to another in a style that can be described as abstract realism. 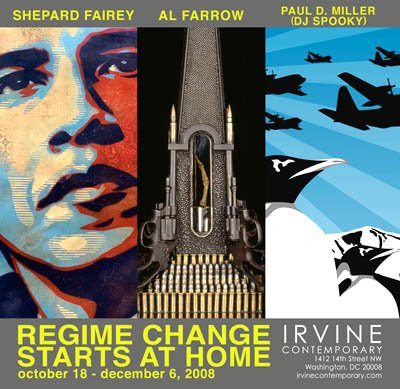 I went to the opening at Irvine Contemporary tonight to see the talents of Shepard Fairey, Al Farrow and Paul D. Miller (DJ Spooky). The exhibition is a knock out! The presence of special security police at tonight's reception added to the feeling of angst depicted by some of the artwork. Al Farrow's cathedral and reliquary, made of guns and bullets blended an eerie fascination of religion and weapons with surreal beauty and austerity. The (trigger finger) reliquary points a scathing finger at the rewards of power. Standing in the space with these three artists works is almost overwhelming. Theirs is the visual power to transport the viewer to new perceptions, to questions, to awareness. From Wired "The whole concept of 'Obey' was getting people to question their obedience," said Fairey. "Now I'm trying to react to what's going on around me in a way that is constructive." Marv over at The Marvelous Collective went on a hunt around DC for a number of Obama HOPE images and OBEY Giants that have consequently appeared all over the city. Click here for images with locations. Tate Britain's marvelous retrospective gives us a haunting vision of life stripped to the bone, a sense of macabre desolation. "He is the single greatest artist that Britain has produced in the hundred years that have passed since his birth in 1909. There is no great secret to his success. Francis Bacon is quite simply the most extraordinary, powerful and compelling of painters." Local artist Laurel Hausler unveils a series of new paintings, ink and watercolor drawings, sculptures and other works. Alternately erudite, evil and beautiful, the works contain elements of narrative, fashion, history and theater. The gallery will host an afternoon of tricks, treats, and art by Laurel Hausler in support of the Washington Animal Rescue League. Grab your brooms and fly on over to Nevin Kelly Gallery to see Laurel's solo exhibition "A History of Dogs and Witches" and enjoy refreshments and hobnob with goblins, witches, and (of course) dogs. Costumes are encouraged! Donation: $10 donation to WARL at the door; Additionally 10% of sales made during the event will be donated to WARL. "I went to hear Shepard Fairey speak at the Corcoran last night and felt compelled to write down everything he said. He verbalized pretty much everything I hope The Pink Line Project represents and ideals by which I'd like to live my life. Here's an early morning summary: Art is about accessibility, visibility, and passion....."
The Arts for Arthritis Gala presents an exclusive opportunity for serious art collectors to enhance their private collections. On-line bidding commenced on Wednesday, October 1st. Please visit the online market to preview the items that will be included in this year's auction and to start placing your bids. The online auction will run from October 1, 2008 to November 6, 2008, with the live event taking place on November 8, 2008. Proceeds go to Arthritis Foundation, Metropolitan Washington in order to support their mission to improve lives through leadership in the prevention, control and cure of arthritis and related diseases. Tell your friends, family, community. Online bidding HERE. Johanna Mueller's artwork will be on display through the week of Oct. 20-25 in honor of Redeem's 2 year anniversary. Check them out online at www.redeemus.com! 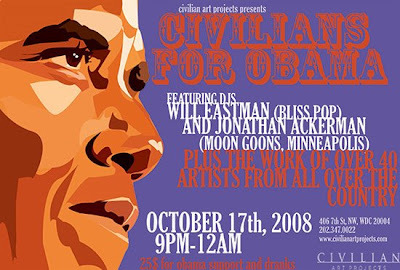 Join Civilian Art Projects, DJs Will Eastman (Blisspop) and Jonathan Ackerman (the Moon Goons, Minneapolis) and over 40 artists from across the USA (and London!) as we dance, raise a drink, and work to get Barack Obama into the White House. $25 at the door gets you in the door and one complimentary drink. All artwork is for sale at $500 (and below) with the majority of the proceeds going to the campaign. This show is ONE NIGHT ONLY so get there early!! Mary Early graduated from Bennington College in 1997. She lives and works Washington, DC. 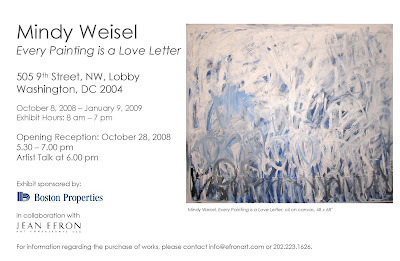 She has exhibited in galleries in DC, MD, and VA, including recent exhibitions at the Rosenberg Gallery, Goucher College, Towson, MD, and McLean Project for the Arts, McLean, VA. Ms. Early is the recipient of an artist fellowship from the DC Commission on the Arts & Humanities. 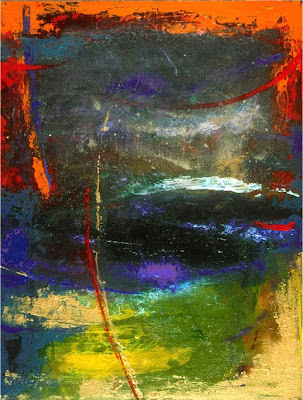 She is represented by Hemphill Fine Arts, Washington, DC. 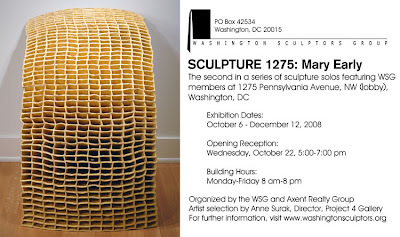 The Washington Sculptors Group (WSG) is a volunteer, non-profit organization dedicated to promoting an awareness and understanding of sculpture in addition to fostering the exchange of ideas among sculptors, collectors, and the general public. The WSG sponsors frequent events, including artists' panels, presentations, workshops, public programs, and co-sponsors a variety of exhibitions in museums and alternative spaces in the Washington area and beyond. Organized in 1983, the work of the WSG is carried out by its Board of Directors, along with its nearly 400 members. Saturday, October 18, 11 a.m. to 2 p.m. Celebrate the important role the arts and humanities play in Takoma Park with free demonstrations, workshops and performances that honor the efforts of the artists, historians, musicians, and cultural groups that enrich our daily lives. For more information call 301.891.7224. A fully illustrated catalogue is available through the gallery, $20 plus shipping. Today the Crystal City Business Improvement District unveiled their latest creative endeavor, Art Walls at the Hyatt Regency in Crystal City, VA. As Crystal City's curator, the BID employs light, art, and design to transform the way people see, perceive and experience the area. The new program infuses color and character into the textures and surfaces of Crystal City to brighten and energize Crystal City's gateways and gathering places. The Art Walls collection includes three projects: Radiance, Prism and Ellipsis. Embraced by Crystal City commercial property owners, the first corporate Art Wall is a partnership involving Gould Property Company, the Airport Hyatt and Concord Residences. Paintings from Anne Marchand's Ellipsis Series were selected for the first Crystal City Art Wall. Twelve of the artists most colorful abstracts are enlarged and direct UV printed onto ten-foot square Dibond panels then mounted onto the back wall of the Hyatt Regency Hotel. Clearly visible from the Concord Residencies and streetscape, the vibrant work adds flavor and spirit to the area. Slideshow of the art installation. For the past two years a dedicated team of architects and planners at Ayers Saint Gross, have been working on on a new university in Orissa, India...adding Humanities and Science to India's interdisiplinary university. This is what shines in good architecture....a grand implementation of geometry and symbolic design. Ayers Saint Gross has designed The Vedanta University to be built in three phases for 100,000 students. 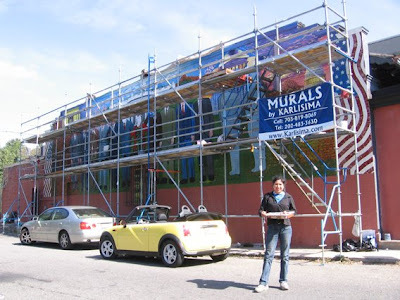 The "Georgia Avenue Global Mural Project" facilitated by muralist Joel Bergner will present images of murals by 5 international artists at Rumberos, a restaurant in Columbia Heights. Each artist will present for 10 minutes and answer any questions people have. October 14, at 6:00 p.m. 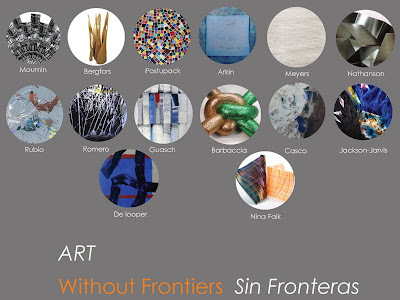 The U.S. Department of State seeks artists interested in loaning work for exhibit in U.S. embassies around the world. Chosen works will be on loan for up to 3 years. Shipping and insurance costs are covered by the Department of State and Ambassadors are encouraged to publish a catalog of the artists' work. For more information visit www.aiep.state.gov/. Deadline: This deadline is ongoing. Sponsors: Louisiana Network, Inc, JCM Entertainment and The DC Social Collective Please join Civilian Art Projects, the Louisiana Network, Inc, JCM Entertainment, The DC Social Collective and curator Aubrey Edward for the closing of "Way Down in New Orleans," an exhibition that unites an array of New Orleans-based artists with artists nationwide; both groups affected and shaped by the storm, and its aftermath. The exhibition officially closes at 5pm on Saturday, October 11. If you miss the closing party come by Saturday from 12-5pm for leftovers and a last chance to see the work on the wall. Don't miss it! Christo and Jeanne-Claude: Over The River, a Work in Progress, an exhibition of more than 150 photographs, collages, drawings, and maps, will chronicle the artists’ process as they prepare to assemble and suspend massive silvery fabric panels horizontally over the Arkansas River in Colorado. Highlighting The Phillips Collection’s longstanding commitment to representing important developments in modern and contemporary art, the exhibition at The Phillips will be followed by a national tour. The Phillips’s exhibition will trace the development of this ambitious project over the past 16 years by displaying the process and materials that will be used to accomplish the artistic and engineering feat. It will be accompanied by a catalogue, and the museum will also screen documentary films on the projects of Christo and Jeanne-Claude. The exhibition is organized by The Phillips Collection, Washington, D.C.
Art Meets Politics: Shepard Fairey and Al Farrow in Dialogue. Shepard Fairey and Al Farrow discuss their innovative work and reflect on the social and political issues that inspire them. Sarah Newman, Curator of Contemporary Art, Corcoran Gallery of Art, will moderate the discussion. A reception follows the program. LINDA HESH will present her For and Against Benches in front of the WPA office in Dupont Circle. Drop by the WPA office where member artist, Linda Hesh will have her For and Against Benches set up outside. DIY City is an online magazine that celebrates the independent artist and the DIY spirit. The idea for the mag grew out of a need to find art supplies and resources in New York City. NYC was a natural pick for our first issue (Feb 2008) as it seems that just about everyone moonlights doing some type of creative work. DIY, or do-it-yourself, has a broad range of meanings. For us it represents the creative spirit of individuals making things in a move away from mass production. Some of the DIYs we’ve met make wares to give or trade with others, while many others make them to sell in the ever growing DIY marketplace. Registration deadline: Friday, October 17th at 5pm. Do you have an idea for a public art piece but no sense of how to make it happen? Are you interested in the questions and dialogue surrounding creating art in the public? Recognizing that public art exists in many forms from sculpture to performance to conceptual, NYFA’s Fall 2008 Business of Art Conference will offer an artist-focused discussion on the ins and outs of public art. Thanks to the DC Commission on the Arts and Humanities for providing a guide to DC Public Art Locations. This map provides photos, videos, and location information for public art sites in the District of Columbia. Ever wonder what those colors in your life mean? Go to Kate Smith's Sensational Color Blog to get some insight on the meaning, psychology and symbolism of color in everyday life. Join DFA for an afternoon discussion of "What Comes Next", John Trevino's solo show of new photographs. Trevino, who teaches painting and drawing at Howard University will discuss the process in creating this series and answer the many questions this exhibit has raised. Also on this day is the Taste Of Georgetown and The Inaugural Fall Book Hill Block Party. Plan on coming to Georgetown early and staying late for an afternoon of art, food, and shopping. The Museum's annual, all-ages celebration of the building arts features hands-on activities; a nail-driving contest; a construction vehicle petting zoo; a ballet featuring skid steer loaders; plus glass designers, stone carvers, woodworkers and others, demonstrating their craft. No charge. Drop-in program, no registration required. Art Whino presents Cheeseburger Sushi, a playful juxtaposition of forms and ideas by artist Brandon Hill. In this solo exhibition Brandon infuses his funky style into a charged cross representation of the modern vs. the traditional, the Eastern vs. the Western, and the image vs. its physicality.Touting the Cheeseburger as the “ambassador” food item of Americanism , Brandon playfully asserts that it is comparable in that sense to the way Sushi is viewed with an association to Japanese-ism. The two, he explains, “serve the same purpose in their level of respective popularity as well as status.” This core concept is the underlying connection within his various works that all incorporate “a fun mix of ideas that could be considered traditional by one culture” and new to another. This show promises to be eye candy for everyone; incorporating 2D works, sculpture, designer vinyl, furniture art, light installation, and (of course) tasty treats, all in Brandon Hill’s unique and light hearted style. Labels: DC Women's Caucus for the Arts, Girls Gotta Run Foundation, Inc.
Northmen's Place Made Southfolk's Thing: Landscapes of Finland and Nova Scotia is a painterly manifestation of Paul Reuther's attraction to and passion for the landscape and culture of the north. The exhibition features the last few years of Reuther's efforts to represent the landscapes of Maine, Maritime Canada and most recently, Kemijärvi, Finland where he attended an artist residency this summer. Northern lights, cool water-based climates, and the outdoors are typical characteristics in Reuther's paintings, all of which were completed on location. October 23 through November 9, 2008. Now in its fourth year, the Food Glorious Food Show serves up an eclectic menu of paintings, sculpture and photographs depicting food in all its fabulous forms. Cooked up by the Zenith Community Arts Foundation (ZCAF), the show's mix of food, art and charity is a recipe that pleases the palates of art patrons and food aficionados, while raising money for the Capital Area Food Bank through a fundraising event, the sale of original art, a calendar showcasing pieces from the show and Giclée prints of select art from the calendar. For tickets and information, call 202.783.0085. The DC Commission on the Arts and Humanities announces a new grant program, DCARTS International, which will offer support for D.C. art's organizations traveling abroad. Guidelines will be available online October 15, 2008. For more information contact the DC Commission on the Arts and Humanities at (202) 724-5613. Deadline: November 12, 2008 at 7:00 p.m.
A letter of intent is required by close of business, Wednesday, November 5, 2008. DCARTS International is an inaugural grant program offering support for District of Columbia arts organizations to travel abroad to participate in cultural festivals, exhibitions, touring programs and other opportunities to share their talents. The DC Arts Commission recognizes the important role cultural communication plays in increasing international understanding. This program aims to cultivate the globalization of Washington's rich tradition of diverse cultural expression and support for highly accomplished artistic talent. Canadian-born painter Renèe duRocher and sculptor Mary-Ann Prack share more than their native country, including a contemporary style inspired by the past and a penchant for abstract figurative art, painted in earth tones with vivid colors and linear grace. Where they differ in this show, is that duRocher's figures evoke a sense of modern society's activity and purpose while Prack's seems timeless and spiritual. in conjunction with the presidential election season in Washington, D.C. Bringing together more than 200 of Richard Avedon’s political portraits of the country’s power elite for the first time, the Corcoran will present many rarely-seen and some never-before-exhibited or published photographs. The Foundation Center will be hosting in cooperation with the Cultural Alliance of Greater Washington free events geared toward equipping artists with the resources they need to pursue fiscal support and funding. For more information visit: www.foundationcenter.org/washington. Join the Capital Area Food Bank and Jodi Walsh from the House of Artistry to help feed those suffering from hunger in our community. For a minimum donation of $25, come out and savor delicious soups and breads prepared by area chefs and leave with a handmade ceramic bowl created by local artists. This art exhibition seeks to raise money to support the activities of The Family Place. The exhibition will consist of abstract art from emerging and established artists who come from different communities in Washington DC. The exhibition also seeks to serve as a bridge between these communities.